Let’s say you’re sitting at home with your iPad and you realize you need toothpaste. With a couple of finger swipes and taps on your iPad — voila — your toothpaste is ordered. Amazon tells you that it will arrive tomorrow. Sweet. But then tomorrow arrives — and your toothpaste doesn’t. What action do you take? It depends on whether you had a safety stock of toothpaste or if you re-ordered with only one day’s worth of supply. If you had a safety stock of toothpaste on hand, you might just ride it out. You can check with Amazon and see that the toothpaste is en route and is scheduled to be delivered sometime before you squeeze the last dollop from the rolled up tube of Crest on your bathroom counter. Even so, you might think twice about ordering toothpaste from Amazon again. There is a glut of other toothpaste suppliers, including the local Safeway. All you have to do is to remember to pick some up the next time you’re grabbing a six-pack of Blue Moon for the weekend. If you weren’t holding safety stock, you can run out to Rite Aid really quickly and see if you can cancel the order with Amazon. In either case, what happened to the supplier? In the “ride it out because you have some safety stock to tide you over” scenario, Amazon keeps its sale to you. But it has jeopardized its downstream repeat sales. In the “race out to Rite Aid and cancel the Amazon order” scenario, Amazon may have lost the sale due to late delivery. In both cases, a late delivery led to a loss of revenue or a potential loss of revenue for the supplier. In this case, it was Amazon — who likely don’t worry too much about a $5 toothpaste sale. But it is tracking its on-time delivery metrics — to study trends, analyze customer satisfaction and nip potential problems in the bud before they become serious. With your toothpaste, it might have been a situation where a particular Amazon warehouse had a burst of orders and your toothpaste was at the end of the pick-and-pack queue — so it missed that day’s outbound shipment. Amazon’s algorithms will adjust where its orders get routed to, so the next person who orders their tube of Crest doesn’t experience the inconvenience that you did. What can your small business learn from Amazon? Other than “use one of the most optimized supply chains in the history of the universe to dominate your competition and change the face of the retail industry forever”? Well, maybe not that. But you can pay attention to your on-time delivery and make sure your small business is trending in the right direction. Your on-time delivery goal should be 100%. That’s a scary number for some people. It means being perfect. Goals are sometimes set at 99.5%, 98% or even 95%. But those are difficult numbers to hit. Think about your response to the late toothpaste delivery. Do you want .5% or 2% or 5% of your customers considering replacing you with Safeway or Rite Aid (or whomever your competitors might be)? Late deliveries are a very visible way to let your customers know your supply chain isn’t optimized. You’re a customer, so you know this. So what can you do about it? Yes, you can set your on-time delivery goal at 100% — but then what? On time delivery to your customer is driven by several factors. Lead time management, inventory management, and your own supplier management have to be optimized for you to be able to wrestle control of your small business’ on-time delivery. Do you know how long it takes it takes you to deliver your products to your customers? Yes, you think you know, but do you really know? Every business – including your small business – has many lead times to manage. There is the lead time it takes for you to pick an order from inventory that you have in stock. And then pack that order and prep it for shipment. And then the time it takes to travel in transit to your customer and arrive on their dock or doorstep. But if a customer orders a product from you that you don’t have in inventory, how long does it take you to procure or fabricate that product? That’s another lead time. And that lead time is comprised of many internal lead times. How long does it take to manufacture the product? Are there any components or raw materials that need to be procured — if so, how long does that take? Once you make the product, how long does it take to inspect it and put it away so that it becomes nettable inventory (i.e. it is ready for allocation to a customer)? And when you do have to procure a component or raw material, your supplier has to manage all of their lead times, too — so that it can deliver to you on time. Lead time management is one of the most critical and yet overlooked aspects of controlling on-time delivery. 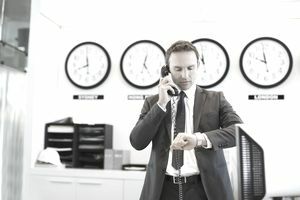 If you allow your customer to place an order on your small business that requires the delivery of a product in two weeks — and your lead times mandate that it takes six weeks to deliver their product, you’re setting yourself up for on-time catastrophe. But if you know it’ll take you six weeks to deliver a product and you work with your customers so that they are placing orders six weeks in advance, you are setting yourself up for on-time delivery success. Do you know what you have on hand and available to ship? You probably think that you do, but do you really? This is how you can know for sure. Check your inventory management system for a few sample products. Your inventory management system might be an ERP system, Excel spreadsheet, or Post-It note with scribble on it. If you don’t have any of these, you’ve got a high likelihood of low inventory accuracy. Once you’ve checked your inventory management system, now walk to where your inventory is physically located — i.e. your warehouse, garage or hall closet. Now do a physical count of the products that you checked in your system. Does your physical count match the system data? If so, congratulations. You’ve got inventory control. Now repeat this task every day with different parts and start over again once you’ve counted them all (or the most valuable ones). If your physical count didn’t match the system data, go back to square one. Why didn’t they match? Implement countermeasures to prevent that from happening again. What does inventory management have to do with on-time delivery? If you tell your customer you can ship its order of 100 pieces because your inventory management system tells you that you have 100 pieces, but you discover that you only have 90 pieces — well, you’re not going to ship that customer’s order complete and on time. When your customer is working with you to make sure you deliver to them on time, they are engaged in supplier management. And because the supply chain is, well, a chain, you should actively manage your suppliers’ on-time delivery, quality, and its own lead time management. By working closely with your suppliers, you can make sure you deliver to your customers on time. You can bet Amazon is working with its suppliers to make sure the next time you order your tube of toothpaste, you will get it when you want it.